There are three steps to the On Page SEO Checker setup wizard: Entering landing pages and keywords, choosing crawler user agent, and scheduling a re-collection of ideas. On Page SEO Checker can also integrate data from Site Audit, Google Analytics and Google Search Console to inform some of its ideas. As far as limits go, PRO users get 500 monthly units, while GURU and BUSINESS accounts get 800 and 2,000 monthly units respectively. The first option you will notice when setting up is your target location. Target location can be set to a country, region, or city level. After setting the location, choose if you want to target either desktop or mobile phone results. Since your desktop and mobile search rivals may be different, make sure you choose the right device for your strategy in order to get the best ideas. In select countries, you can also change the language of your targeting. This determines the language of the Google results that SEMrush will use to find your rivals and give recommendations. After setting your targeting, you can choose the pages on your site that you wish to receive ideas for. Your options are Auto Import, Manual Import, File Import, Google Search Console, or Organic Research (SEMrush Organic Positions Report). The Auto Import function will source data from an Organic Positions report and a Position Tracking campaign (if you have one set up in the same project) to suggest pages on your website ranking between position 11 and position 100 in Google’s results. We use this range in order to suggest pages that have the potential to move up to the first page of results after SEO improvements have been implemented. If there are keywords and landing pages here that you do not want to target, remove them with the trash can icon at the end of the row. This option allows you to manually enter a page and corresponding target keywords. Here you can enter a landing page and a number of target keywords that you want to target with the same page. Keep in mind that the tool will not allow you to target the same keyword with more than one landing page, since that could lead to your pages competing against each other for traffic from the same search. This option allows you to upload a .csv file of landing pages and target keywords to the tool. Please follow the instructions listed in the setup window and format the first column with your keywords and second column with landing pages. Integrating with Google Search Console can show you the pairs of keywords and landing pages on your site that get the most amount of clicks. After importing, we give you added filters that Google Search Console does not offer in its interface. You can filter by metrics like clicks, impressions, CTR, and Position of each page and keyword. You can also filter by ‘containing’ or ‘not containing’ keywords to look for pages that target a specific topic. These filters can be combined so you can evaluate your GSC data on a deeper level. So, if you have a page that ranks lower on the first page but still receives some clicks, you can identify it and add it to your campaign and get ideas to optimize it accordingly. 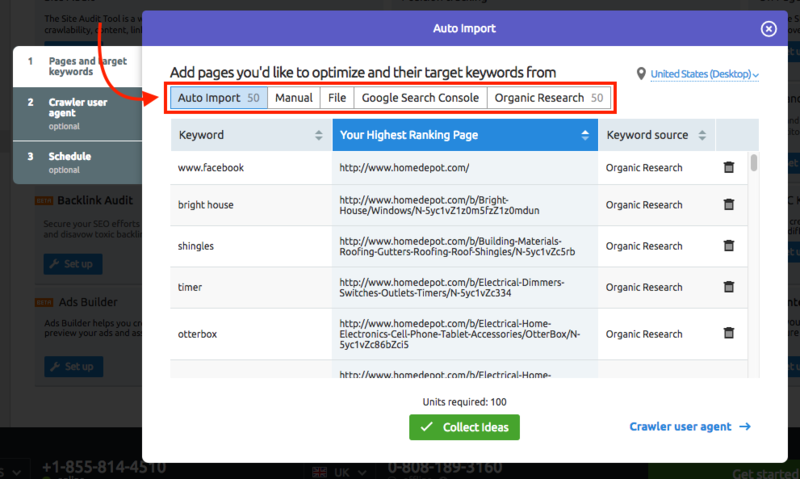 This last option gives you the ability to add landing pages and keywords from your site directly from SEMrush’s organic research database. The benefit of using this option is that you can filter the report to get specific landing pages or keywords. Advanced filters include database, landing page position range, keyword volume, and keyword containing or not-containing filters. Set position at 11-20 to find your pages that are on Google’s second page, position 21-30 to find pages on Google’s third page, and so on. You can also choose how many keywords you want to target here - but the more keywords you add, the more units it will require from your budget. Please note: the keywords you add to the tool from any of the 5 input options above will combine to charge your limits. So if you add 50 keywords from Auto Import, 10 keywords from manual import, and 50 keywords from Organic Research, you will be using 110 of your units. The total number of units required will be noted at the bottom of the setup window directly above the “Collect ideas” button. 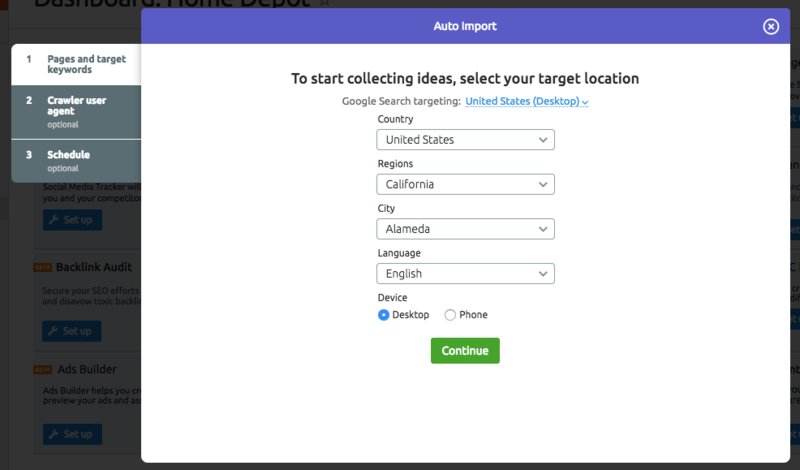 After importing your keywords and landing pages, you have the option to “Collect ideas” and start using the tool. There are two more steps in the setup wizard (Crawler settings and Scheduled re-collection of ideas), but they are both optional when first setting up your project. The user agent is used to scan the web pages on your and your rivals’ sites to determine what can be improved. Some websites may be blocking the SEMrush Bot with rules in their robots.txt. If this is the case, you would want to choose the user agent that we call GoogleBot. Most websites don’t block the GoogleBot because they need it to crawl their website to be indexed, so this option will allow us to crawl your site and provide you with our ideas. If you still encounter issues, you should whitelist the bot we use to crawl your website. Lastly, decide if you want to schedule the tool to re-collect ideas on a weekly basis or never. If you choose weekly basis, the tool will recrawl every Monday. You can also ask for an email update following each scheduled crawl. After configuring, your Overview report will provide a total number of recommended ideas to improve your landing pages’ SEO. The following tools can be integrated with SEMrush’s On Page SEO Checker to provide more accurate data and a more comprehensive analysis than by using the tool alone. As stated earlier, this can be connected in the setup wizard or from the Optimization Ideas tab. When you connect your Google Search Console account, you can choose the best pages to work on for your site considering actual traffic numbers and clicks. If you connect your Google Analytics account to On Page SEO Checker, you can receive ideas to improve your website’s user experience. SEMrush will base these ideas off of bounce rate, time on page, and page load time information taken from your Analytics account. Running a Site Audit in the same project as your On Page SEO Checker campaign will help by generating Technical SEO ideas based on the issues found in the Audit. You’ll receive helpful ideas such as removing duplicate content, adding needed internal links, using proper <title> and <meta> tags, and more. As you receive ideas to improve your landing pages, you can send an idea to Trello from the Optimization Ideas table. To add an idea to Trello, you need to expand an idea from the Optimization Ideas tab and use the green "Send to Trello" button. Doing so will allow you to manage a workflow in Trello as you prioritize and complete each recommended idea.